Superior quality domestic and semi professional 2 litre water capacity with stainless steel 1.3l litre boiler. Manual water filling with safety cap. Iron with cool cork covered handle. Light and easy to carry and store. As your drycleaner knows, steam is the gentlest, safest, most efficient method to remove wrinkles from fabrics. The powerful action of steam penetrates the fibres, relaxes them and causes the wrinkles to release. Unlike ironing, the gentle method of steaming increases the life of clothing. Steaming breathes new life into fabrics; conversely, ironing crushes clothing fibres. 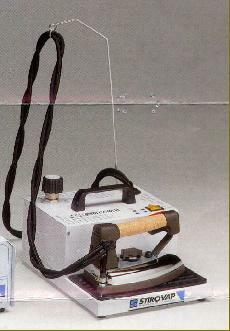 Many users have found that steaming is up to five times faster than conventional ironing. This 230v versatile steamer has even been found by some owners to eliminate dust mites in bedding. You will enjoy discovering new applications for this powerful and flexible appliance in your home. Superior quality professional style adjustable height folding heated vacuum table specially made to accommodate separate boiler safely. Draws away steam preventing dampness. Thermal protection of table heating element. Supports separate 371 3 litre boiler securely and safely at the right height. Internet price £381.88 including vat within UK+EC. Stirovap 376 boiler & iron. 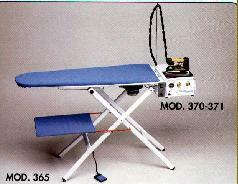 Stirovap 365 heated vacuum table for 305 4 litre boiler. Patterson St, Blaydon, Tyne & Wear, NE21 5SD. England, UK.